Scotland was one of the first refuges for sincere Christians in the early centuries. The persecution perpetrated by the pagan emperors led a great number to seek refuge in far-off countries. Many of them fled to England; and once persecution arrived there, they continued fleeing to more remote places in Scotland and Ireland. One of the first Reformers to arise in Europe was Colomba. Born in Ireland in 521 but later expelled from Ireland for his firmness in sharing copies of Bible manuscripts that he had copied by hand, he journeyed to Iona, an island in Scotland, where he founded one of the first Christian missionary schools. The work of Colomba spread light to Scotland and the surrounding areas in the Sixth Century not only through his preaching but also through his twelve disciples and the many students who graduated from the missionary school. “For hundreds of years after the churches of England submitted to Rome, those of Scotland maintained their freedom. In the twelfth century, however, popery became established here, and in no country did it exercise a more absolute sway. Nowhere was the darkness deeper. Still there came rays of light to pierce the gloom, and give promise of the coming day. The Lollards, coming from England with the Bible and the teachings of Wycliffe, did much to preserve the knowledge of the gospel, and every century had its wit- nesses and martyrs.” –The Great Controversy, p. 249. Two of the nobility who had con- tact with the writings of the Reformers and decided to lift their voices against the false doctrines of Rome, especially against the veneration of Mary, were Patrick Hamilton and George Wishart. Although they were silenced by the stake, their messages awoke Scotland. 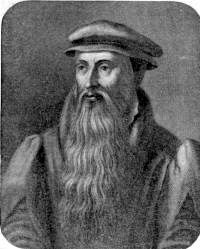 John Knox would rise to continue to push forward the Reformation and exert an influence that would affect all of Europe. John Knox was born in about 1513 in Haddington, a small town south of Edinburgh, Scotland. His humble beginnings facilitated contact with the majority of the people, and his high education helped him to reach the high classes of society. He lost his parents when he was just a child. Knox studied Latin in school in Haddington. In 1529, he began his theological studies at the University of Saint Andrews. He was ordained as a priest in 1536 but was not employed in this capacity due to the fact that Scot- land already had too many priests. In 1540, the Scottish authorities abandoned the Protestant faith and began to persecute the preachers. George Wishart did not fear the time of test and traveled from village to village to proclaim the Bible truths. Knox, in- spired by Wishart’s message, decided to accompany him as his bodyguard, armed with two swords to defend the preacher against the threats of the prelates. For five weeks, he accompanied Wishart in his preaching until the authorities decided to silence the noble’s voice by putting him in prison. Knox was determined to join him and sup- port him, but Wishart persuaded him to return home, saying: “Nay, return to your bairns [children], and God bless you. One is sufficient for a sacrifice.” – Jasper Ridley, John Knox. Oxford: Clarendon Press, 1968, p. 43. Knox returned to teach the children of the nobility. Henry Balnaves, one of the nobles, was impressed by the Reform- er ’s teaching talents and joined the preacher John Rough in inviting Knox to become the chaplain and pastor of the congregation of the castle of Saint Andrews. Knox refused the invitation, saying that they did not have the authority to make this call and returned to his room in tears. A few weeks later, he attended a service in which the Exhibitor defended the Roman church as the bride of Christ. Knox could not be silent and argued that the Roman church was not the bride of Christ but a whore. The congregation requested that his statement be examined the following Sunday. So, seven days later, he presented Daniel 7, comparing the papacy with the antichrist, a prophetic interpretation that was later inherited by Adventism. Knox acknowledged the Scriptures as the sole authority for establishing doctrine and confirmed the importance of justification by faith alone, elements that remained characteristic of his message for the rest of his life. Days later, he also presented a thesis against the mass, purgatory, and prayers for the dead. Thus began the public career of John Knox, who became one of the most powerful preachers of the Protestant era. A group of sixteen nobles, followers of the martyr Wishart, enraged with Cardinal David Beaton for killing the preacher, killed the cardinal at his residence two months later and moved into the castle of Saint Andrews, a Protestant center where Knox took up residence a year later. Because of this rebellion, the Catholic Queen Regent Mary of Guise decided to seek the aid of Henry II, King of France, who sent a fleet of ships and attacked the fortress of the castle of Saint Andrews. On July 31, 1547, the Reformers in the fortress surrendered to the French navy and were taken captive. Among them was John Knox, who was now chained to benches in a ship’s galley without room to move or change position. Along with other prisoners of war and convicts guilty of various offenses, Knox was forced to paddle and row, with an officer on one side ready to whip the slaves who did not follow orders in doing the hard work. In the galleys, the slaves were forced to participate in the mass and give the sign of veneration for the virgin, or suffer torture. Knox refused. When the picture was pushed into his face so he would kiss it, he seized the picture and threw it into the sea, saying, “Let our Lady now save herself: she is light enough; let her learn to swim.” –W. Stanford Reid, Trumpeter of God. New York: Charles Scribner ’s Sons, 1974, pág. 57. After several months and facing the harsh winter in the galleys, Knox’s health rapidly deteriorated. Despite being sick, he comforted his companions in suffering, confident that they would be released and would carry forward the mission of proclaiming the Bible truth. Nineteen months of in- tense suffering, torment, and affliction passed before he was finally released in February 1549, possibly at the request of King Edward VI of England, who was Protestant-minded. On April 7, 1549, Knox was called to minister as a preacher in the town of Berwick-upon-Tweed, under the Church of England. At the end of 1550, he was transferred as a preacher for Saint Nicholas’ Church in Newcastle upon Tyne; and then in 1551, he was appointed Chaplain of the King along with five others, receiving the opportunity to preach before royalty. During this time, he was opposed to the practice of receiving the communion while kneeling as well as to the doctrine of transubstantiation–the belief that the actual body of Christ was contained in the elements of the sacrament. Knox met Elizabeth Bowes, a very active Protestant believer and scholar of the Scriptures, whom he came to consider a spiritual mentor, and Margery Bowes, one of her daughters, to whom he proposed marriage in 1553 and married shortly afterward. A year later found him in Geneva, Switzerland, having fled from England when Mary Tudor came to the throne and re-established Roman Catholicism in England. Knox published a flyer attacking the queen for her Catholic positions, the bishops who influenced her assumption to the throne, and the Roman Emperor, Charles V, calling him “no less enemy of Christ than was Nero.” –Geddes MacGregor, The Thundering Scot. Philadelphia: The Westminster Press, 1957, p. 70. Shortly after arriving in Switzerland, Knox received a letter inviting him to pastor a church of English exiles in Frankfurt, Germany, to which he agreed. In Frankfurt, a new problem arose: The liturgy in the religious service. Opinions were divided with the arrival of new refugees. Some supported a new liturgical system promoted by Knox and others, a strict monitoring of the book of liturgies of the Catholic Church. Through the counsel of Calvin, Knox achieved an agreement; but with the arrival of even more refugees, the pressure increased to such an extent that the opponents filed an accusation before the authorities in Frankfurt, and he was asked to leave. Consequentially, Knox returned to Geneva, Switzerland. In Scotland, despite the supremacy of Rome, some nobles made the decision to establish the word of God as the basis of their congregations, rejected Catholicism, and made Protestantism the official religion of the country. Some of them invited Knox to return to Scot- land to inspire the Protestant movement. After repeated invitations, Knox decided to return to Scotland. For nine months he devoted himself intensely to the preaching of the reformed doc- trines and the new liturgy in different churches in Scotland. His return to Scotland and its renewed popularity alarmed the Catholic bishops, who summoned him to appear in Edinburgh on May 15, 1556, considering him a threat to the authority of the church. Knox was accompanied to the meeting by many influential nobles, and the bishops decided to cancel the legal proceedings. Knox was now free to preach the Protestant principles openly. Suddenly Knox decided to return to Switzerland, and he arrived in Geneva on September 13, 1556, along with his wife, Margery Bowes, and his mother- in-law, Elizabeth Bowes. These were the happiest years for Knox, despite his hard work as a pastor in the English church in Geneva, which gathered in the Église de Notre Dame la Neuve (New Church of Our Lady), now known as the Auditorium of Calvin. In Geneva, his two sons were born, Nathaniel and Eleazar. Knox recommended Geneva to all his friends in England as the best place of asylum for Protestants. In one of his letters he wrote: “I neither fear nor eschame to say, [Geneva] is the most perfect school of Christ that ever was in the earth since the days of the apostles. In other places I confess Christ to be truly preached; but manners and religion so sincerely reformed, I have not yet seen in any other place….” –Reid, p. 132. In 1558, he wrote in Geneva one of his most famous pamphlets, titled “The First Sound of the Trumpet against the Monstrous Regiment of Women.” Knox referred to the Catholic queens Mary I of England and Mary of Guise of Scotland as persecuting Protestants and said that they should be removed from authority. This brochure was pub- lished anonymously and without con- sultation with Calvin. It was officially banned in England and even in Geneva by Calvin, who rejected it outright. Knox himself acknowledged that this booklet completed his drifting away from his friends in England. Elizabeth Tudor, who became queen a few months later, was deeply offended by the pamphlet and never forgave Knox. When a queen favoring Protestantism, Elizabeth Tudor, came to the throne in England, the English refugees in Geneva decided to return to their country. Knox decided to return to Scotland. Be- fore his departure, the Geneva authorities gave him an honorable mention for his Protestant contributions. In Scotland, the situation had be- come very tense between Queen Re- gent Mary of Guise and the Protestant uprising. Within days after his arrival in Scotland, Knox preached an eloquent sermon in the city of Perth against Catholic idolatry. As soon as he finished, a riot arose against the Catholic Church, resulting in the destruction of images, altars, and temples; and the walled city of Perth was dug into. Mary of Guise reacted by sending local troops to surround the city. Finally an agreement was negotiated by the Protestant militias to avoid a war with French troops allied to Mary of Guise. But once the city was entered, the queen regent filled it with her Scottish soldiers financed by France. This was taken as a betrayal on the part of some nobles who had supported the agreement between the Protestants and the supporters of Mary of Guise, so they decided to change their position and support the Protestant Reformation. Because of the problems in Perth, Knox went to Saint Andrews, where again he preached a fiery sermon that brought about the same consequences as in Perth–an uprising with vandalism of the Catholic Church property. Protestant militias armed and took control of several cities in Scotland, supported by the dynamic Knox’s preaching. The Protestant nobles, with the help of the militia, again occupied Edinburgh, Scotland’s main city. On July 25, 1559, the Articles of Leith were signed, after which the leading Protestant nobles, called Lords of the Congregation, withdrew from the occupation of Edinburgh and the Queen Regent of Scot- land, Mary of Guise, promised freedom of conscience. But the Queen regent had other plans. She requested support from French troops. As soon as they arrived at the port of Leith, the Protestants took back the city of Edinburgh and formally deposed Mary of Guise from the Regency of Scotland. Some nobles managed to convince England to send soldiers to assist the Protestant militia. The sudden death of Queen Regent Mary of Guise on June 10, 1560, paved the way for a peaceful solution. On July 6 of that year, the Treaty of Edinburgh was signed, under which the French Navy and the English would withdraw from Scotland, strengthening the Protestant cause. On July 19, Knox held a service of gratitude at the national lev- el in the Chapel of Saint Gilles in Edinburgh. – The jurisdiction of the Pope in Scot- land was abolished. – All doctrines and practices contrary to the Protestant faith were condemned. – The worship of Mary was rejected. – The mass in Latin was abolished. – Catholic holidays were done away with. – Prayers for the dead were banned. – The belief in purgatory was condemned. – The celebration of the mass was forbidden. – It was confirmed that the Eucharist is only a symbol, in opposition to the doctrine of transubstantiation. – Respect was confirmed for the authorities whenever they recognized God as the Supreme Authority and the Ten Commandments. In addition, Parliament commissioned Knox and other ministers to prepare the new organization of the reformed church in Scotland and the “Book of Discipline.” New religious services shifted the emphasis from being centered on priests to a partnership of all believers, with Bible studies, sermons, prayers, reading of Psalms, and congregational singing. In December 1560, Knox received a serious blow when his wife Margery died, leaving to his care two small children, two and three years of age. Not long afterward, on August 19, 1561, the sound of cannons was heard in the port of Leith, announcing the arrival of the young Queen Mary, daughter of the deceased Mary of Guise, who had been a refugee in France. It was declared that there would be no change in religious matters and that nothing should trouble her Catholic servants. Several nobles, who were interested in politics, decided to give their support to the new queen, but not John Knox, who raised his voice, preaching against the Catholic positions of the queen. Queen Mary summoned Knox two weeks after her arrival in Scotland, accusing him of rebellion and writing against her authority. “When brought face to face with the queen of Scotland, in whose presence the zeal of many a leader of the Protestants had abated, John Knox bore unswerving witness for the truth. He was not to be won by caresses; he quailed not before threats. The queen charged him with heresy. He had taught the people to receive a religion prohibited by the State, she declared, and had thus transgressed God’s command enjoining subjects to obey their princes…. “ ‘You shall believe God, who plainly speaketh in His Word,’ answered the Reformer; ‘and farther than the Word teaches you, ye shall believe neither the one nor the other. The Word of God is plain in itself, and if in any one place there be obscurity, the Holy Ghost, who never is contrary to Himself, ex- plains the same more clearly in other places, so that there can remain no doubt but unto such as are obstinately ignorant.’ “ –The Great Controversy, pp. 250, 251. Knox was summoned to trial on several occasions by the queen, but the Reformer always responded with firm principles and managed to remain free due to his great influence and the support of the Protestant nobles. He reminded the queen that she should conform to the laws of Scotland and that the mass was forbidden. While the young queen had support from the nobles in politics and wished to reinstall the mass, Knox did not fear to defend his Protestant principles, continuing to influence decisions. On March 26, 1564, Knox, being a widower and 50 years of age, decided to marry again, and did so with the young Margaret of Stewart, with whom he had three daughters–Martha, Margaret, and Elizabeth. Knox did not silence his voice. In 1565, he preached, as he had done so many times, with conviction and fervor, against the marriage of Queen Mary to the Catholic Henry Stuart. This marriage did not last long, for Stuart was murdered. Queen Mary married again, this time to the main suspect in the murder of Stuart. Because of these suspicions, the authorities of Scotland forced the resignation of Queen Mary, and she was imprisoned in Loch Leven Castle but managed to escape on May 2, 1568. Scotland became embroiled in a civil war between those who supported the deposed Queen Mary and the Protestants. In 1571, the controller of Edinburgh Castle, which again supported Queen Mary, expelled the Protestants from the city. Knox retired to the castle of Saint Andrew but returned in 1572, already very weak physically because of his age but, as always, firm in his principles to disseminate the word in the chapel of Saint Gilles, to introduce his successor, pastor Lawson of Aberdeen. Knox returned to his home for the last time and died on November 24, 1572, comforted by his young wife and surrounded by several of the Protes- tant nobles. His last wish was to hear the reading of God’s word. His remains were buried in the Church of Saint Gilles with the words of the new Re- gent of Scotland, James Douglas: “Here lies one who never feared anyone.” –Reid, p. 283. He remained true to his mission and to God’s truth, waging the battles of the Lord until Scotland received its freedom. The Presbyterian Church considers John Knox one of its founders. “If we have the interest that John Knox had when he pleaded before God for Scotland, we shall have success. He cried, ‘Give me Scotland, Lord, or I die.’ And when we take hold of the work and wrestle with God, saying, ‘I must have souls; I will never give up the struggle,’ we shall find that God will look upon our efforts with favor.” –Evangelism, p. 217.